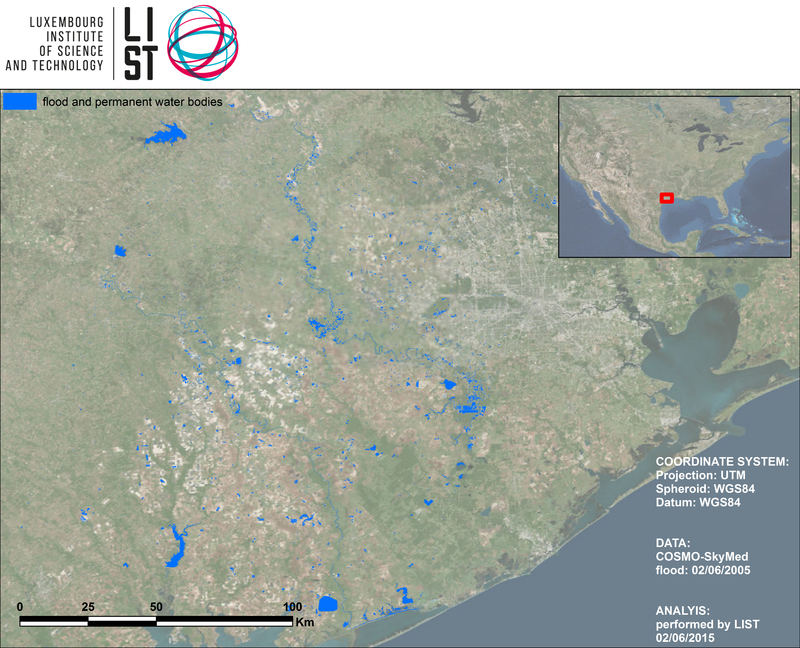 EO-1 image showing the flooding along Peach Creek in Texas at 1045 Central Daylight Time on 27 May 2015. Courtesy of NASA. Texas and Oklahoma experienced their wettest month on record in May 2015, turning a long-term drought into a severe flood event. Numerous streams reached record levels and at least 31 people were killed; property damage amounted to $45 million for public property and millions more for private property. 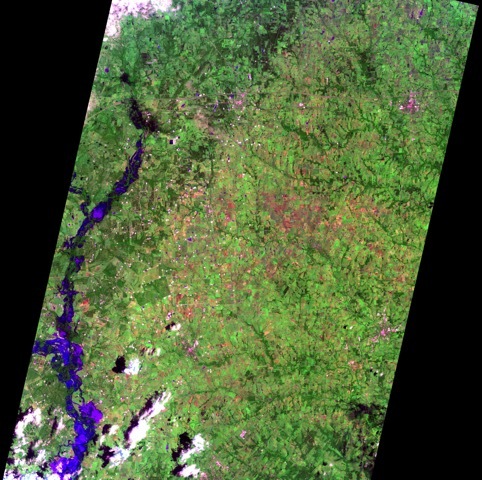 Synthetic Aperture Radar (SAR) images (1-100 meters resolution, depending on the scan mode) from the Italian Space Agency (ASI) COSMO (Constellation of small Satellites for the Mediterranean basin Observation)-SkyMed satellites (Figure 2). Unlike visible-wavelength images, SAR can see through clouds, which is highly valuable since flooded areas are often cloud-covered. COSMO-SkyMed image of the flood regions and other water bodies (blue) on 2 June 2015, analyzed by the Luxembourg Institute of Science and Technology in support of the Flood Pilot. 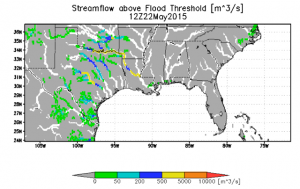 In addition, the Global Flood Monitoring System (GFMS) of the University of Maryland provided real-time flood forecasts (Figure 3) to supplement to forecasts produced by the US National Weather Service. The University of Texas at Austin, who provided imagery to the Texas Emergency Operations Center and the Governor’s Emergency Management Council to coordinate responses to the flooding. 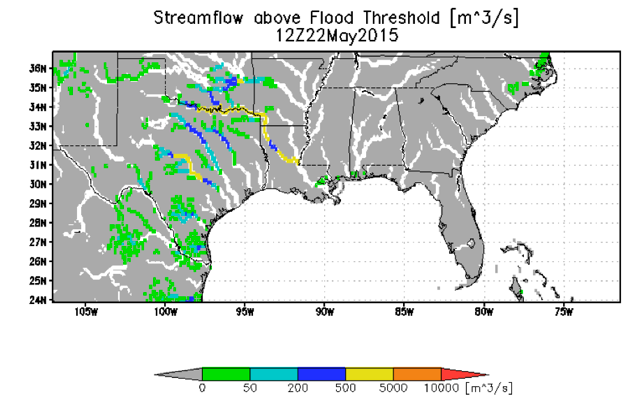 Inundation forecast at 1-km resolution for southeastern Texas valid 1800 UTC 28 May 2015 produced by the Global Flood Monitoring System of the University of Maryland in support of the Flood Pilot.